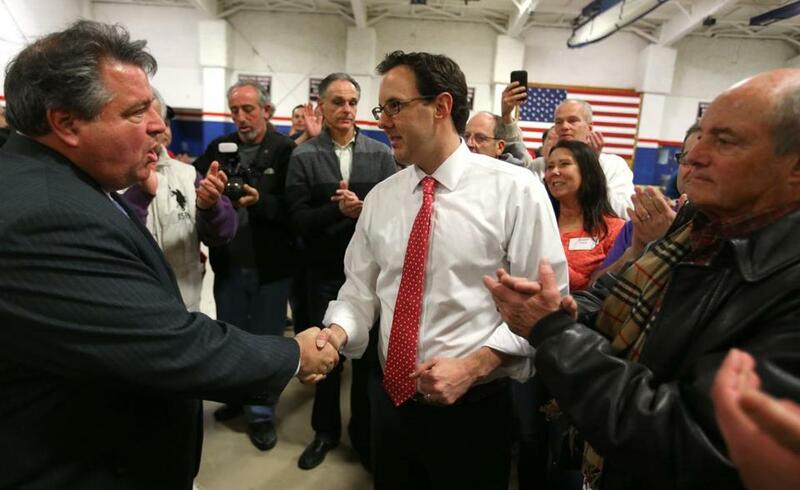 Current Revere Mayor Dan Rizzo (left) congratulated Brian M. Arrigo after the recount Tuesday. REVERE — Brian Arrigo woke up at 5 in the morning Tuesday, fed his 9-week-old son, cleared his car of snow, and said a little prayer. Nearly 12 hours later, the Revere Election Commission officially named Arrigo mayor-elect, upholding his Nov. 3 election at the polls. That day, Arrigo had bested incumbent Dan Rizzo by 118 votes. That tally changed slightly Tuesday during a court-ordered recount, with Arrigo defeating Rizzo by 108 votes, 5,210 to 5,102. “We’re excited about the results,” said Arrigo, 35, a two-term Revere city councilor who arrived at the Revere High School Field House before 9 a.m. to watch the recount. Arrigo, who will take office Jan. 4, said his main focus would be crafting Revere’s $170 million annual budget. “The biggest issue is going to be the budget and making sure that taxpayers are getting the most services for the dollar,” said Arrigo, who works as a budget manager for the MBTA. Incumbent Dan Rizzo lost reelection to another four-year term to City Councilor Brian Arrigo by 118 votes. Rizzo, a one-term mayor, said his failure to bring a casino to Revere’s Suffolk Downs — which took up much of his tenure as mayor — might have affected the election. The recount began mid-morning, after more than 10,000 ballots had been wheeled in by workers who were flanked by Revere Police. On Monday, those ballots had been separated into packs of 50 at Revere City Hall. Meanwhile, about 150 Rizzo and Arrigo supporters braved the snow and icy rain to watch the recount — where 24 workers tabulated the votes and another 24 volunteers from both campaigns stood watch. Silence hovered over the vacuous field house for most of the day as a phalanx of attorneys representing each candidate observed the process, which was overseen by the legal firm of Kopelman and Paige, representing the Revere Election Commission. 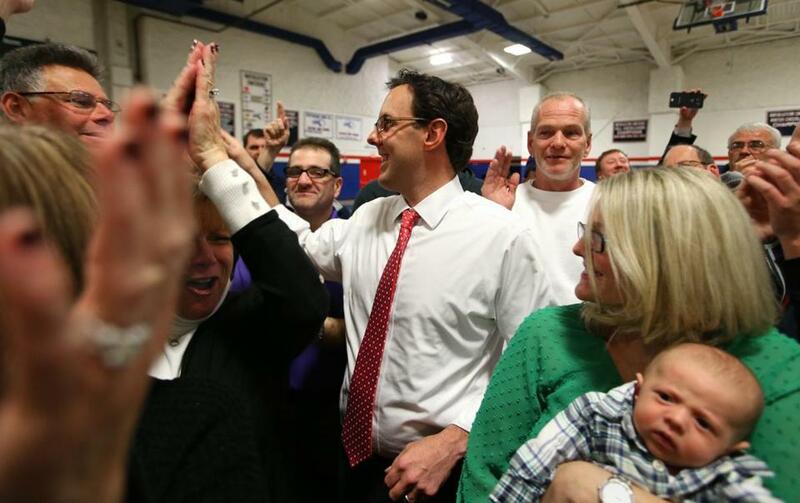 Revere residents who watched the recount said the process reaffirmed their belief in democracy. Despite the loss, Rizzo plans to stay in politics and said he leaning toward running for the soon-to-be-vacant state senator’s post in the First Suffolk and Middlesex District currently held by Anthony Petruccelli, an East Boston Democrat. 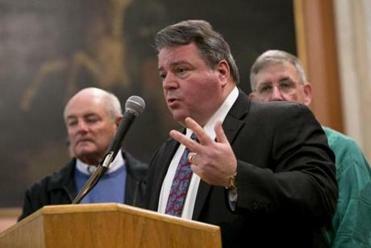 Petruccelli is expected to resign in January to take a lobbying post in Boston. The mayoral recount, which took seven hours to complete and could cost the city as much as $25,000 in legal fees and for extra police details, has been in play since the Nov. 3 election. Rizzo sought the recount on Nov. 13, when he faxed the paperwork to the election commission from the Caribbean while on vacation. He also signed a power of attorney authorizing his brother, Paul, to execute recount petition papers on his behalf. The unusual way the mayor requested the recount raised legal questions for the city’s election commission, which took no action on Rizzo’s request. Rizzo then took the matter to court. Earlier this month, Suffolk Superior Court Judge Heidi B. Brieger ruled that the election commission must hold the recount before Jan. 4, when the mayor is set to be inaugurated. Brian Arrigo, who works as a budget manager for the MBTA, celebrated at the recount Tuesday. His wife, Daveen (right), held their 9-week-old son, Joseph. Steven A. Rosenberg can be reached at srosenberg@globe.com. Follow him on Twitter @WriteRosenberg.